Located in southeast Rains County, less than 75 miles East of Dallas Walnut Hill on the Sabine contains nearly three and a half miles of Sabine River frontage along its southern boundary. Rains County Road 2440 provides end of the road access into the ranch’s secure, gated entrance. The approach to Walnut Hill on the Sabine offers a scenic view of the remarkable recreational possibilities, carefully constructed water improvements awaiting the owners and guests inside the gate. A modern electric entry gate leads to a private, paved ranch road which meanders for over a mile through manicured hay pastures to the ranch’s classic colonial-style home and headquarters. A carefully planned, interconnecting ranch road system provides convenient access to every area of the ranch and to the Sabine River. Metal bridges, road crowning, cattle guards and concrete low water crossings make traversing the ranch easy and enjoyable. The ranch’s welded high fence is galvanized, stretching approximately 6.5 miles; all drainages and water gaps are double braced and secure. Further enhancing the aesthetics, nearly 1.5 miles of painted black pipe fencing separates the paved ranch road and large hay pasture. An elevation drop of approximately 40 feet occurs from north to south on the ranch. At 380’ the area around the entry gate is the highest point on the property. From this panoramic highpoint, elevations gradually drop to the lowest at 340’ near the Sabine River.The topography interlaced with carefully sculpted roads and designed drainages enhance the rainfall runoff across the ranch during wet months. Oaks, walnut, elm, pecan and other hardwood varieties are the primary tree on the ranch. In the bottomland trees have been carefully sculpted, creating a remarkable “wildlife edge”. In the hay pasture, mature oaks and other hardwood trees provide generous shade and add a natural visual appeal to the landscape. The soil in the bottomland portions of the ranch is primarily Gladewater clay, which is typical for areas near the Sabine River. Gladewater clay is darker in color, productive for food plot crops and moderately permeable. The soils in the upland pasture are primarily Woodtell loam varieties. These Woodtell loam soils are lighter in color, well drained and highly productive for crop and grass production. The meticulous range management practices support the 200+/- acre highly improved Bermuda and Bahia grass pasture. Annual hay yield is reinforced by Rains County’s 40+ inches of average rainfall. Centrally located within the ranch, a 20+/- acre private lake provides year-round recreation with a memorable backdrop. Oak tree groves on the lake’s east and south banks offer an ideal setting for outdoor entertaining, family gatherings and unforgettable sunsets. In late summer, the owners plant grain sorghum along the lake’s edge to further enhance the waterfowl hunting. Walnut Hill on the Sabine’s southern boundary is an ~3.5 mile high-bank stretch of the Sabine River. The river views are naturally impressive and the multiple access points for canoes and small water crafts add the thrills of angling and other recreational dimensions to the ranch. Frank’s Creek traverses the ranch along the northern and eastern boundary. Water from this tree-laden estuary flows southeast, and then turns due south into the Sabine River. Over time, water from Frank’s Creek and the Sabine River has fused, creating a remarkable oxbow lake called “Red Slough”. Nearly a mile in length, with 5+/- acres of surface water at capacity, Red Slough is a water fowler’s riparian jewel. Several other natural creeks and sloughs are blanketed by Spanish moss, palmetto trees, water oaks and button willows; their immediate tree canopy filters the sunlight, creating a setting reminiscent of antebellum low country. In a designated well house, a prolific Wilcox water well (100 GPM) and its 2,000 gallon storage tank provide water for various irrigation needs including the ranch home’s courtyard and numerous stock tanks. Each tank maintains water yearlong, even in dry months. The living quarters and facilities are supplied with water through Bright Star Salem Water Supply Company. Walnut Hill on the Sabine features a variety of waterfowl for outstanding hunting opportunities. Red Slough and other naturally created wetland areas annually host generous populations of puddle ducks which live in a traditional dark woods setting. As the sun rises, Mallards and other dabbling ducks arrive flying in at tree top level; their unmistakable whistling wings backpedal frantically as they slowly descend into the timbered shallow water refuge—a common site at Walnut Hill. 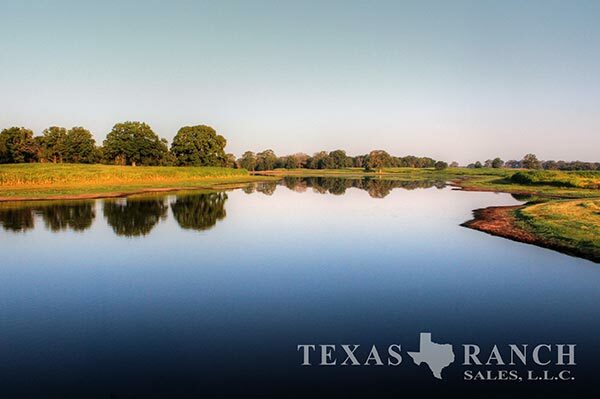 The ranch’s main lake has carefully designed shallow water areas allowing water levels to draw down seasonally. Seasonal down-draws encourage the development of moist soils and allow the landowner to plant fall waterfowl crops in advance of the upcoming season. 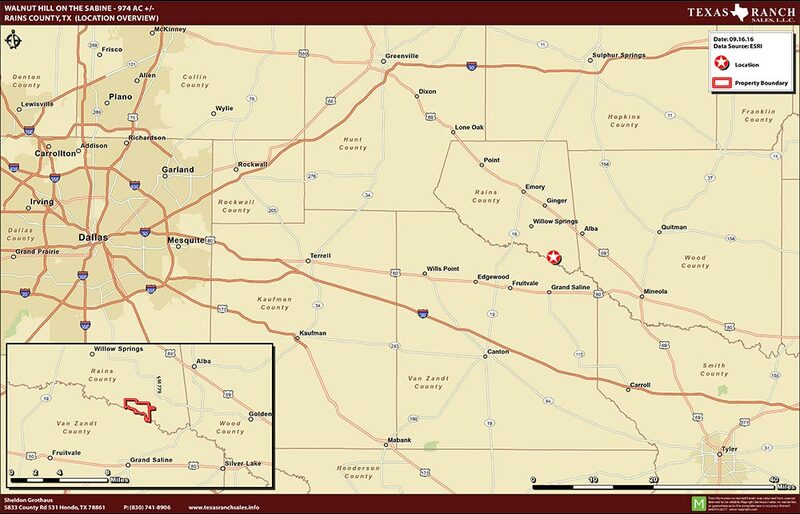 A game-fenced sanctuary for world class whitetail deer hunting (the existing whitetail herd contains approximately 160 deer), the ranch under meticulous MLD Level III management, has resulted in genetics that are rare for this area of the state of Texas. Annually, numerous bucks exceeding 200”B&C continue to breed within the preserve and some are harvested. Native browse, productive soils, a diverse tree canopy, and the scenic perennial / annual food plots fused with the owner’s supplemental nutrition program creates an easily sustainable habitat, ensuring the herd’s best interests are met annually for maximum yield. An iconic East Texas river fishery stretches for approximately 3.5 miles along Walnut Hill on the Sabine’s southern boundary. Sabine River fishing for black bass, sand bass, stripers, catfish, alligator gar and other game fish is exceptional, challenging anglers of all skill levels. Convenient canoe and kayak access to the river is possible by way of a sloped concrete bulkhead. For the lake fisherman, the ranch has lake water for trophy bass fishing potential; conveniently, the western bank of legendary Lake Fork is less than 10 miles from the ranch’s entry gate! The ranch’s magnificent colonial-style red brick home and courtyard are perfectly positioned on a hilltop overlooking the private lake and wildlife sanctuary. The custom three-story home was built in 1998 and features 6 bedrooms and 4.5 bathrooms with vast balcony porches, which provide spectacular multi-directional views. The home’s centerpiece is a grand trophy room boasting 32’ ceilings. From the trophy room, a landing and separate staircase leads to additional, private guest quarters with 2 bedrooms and a full bathroom. A generous driveway and parking area lead to an oversized 3-car garage with an adjoining mudroom. The home’s construction benefits from post tension engineered foundation consisting of 632 yards of concrete and 110 twenty-foot piers. Impressive interior finishing includes custom red oak cabinets and trim throughout, modern stainless steel appliances, granite counter tops, interior pillars, multiple fireplaces and much more! Insulated Metal Shop - 24’6”x24’6” – 600 SF – game cooler, tool and equipment storage. 1,000-gallon diesel and 100 gallon gasoline storage tanks. All utilities (electricity, water, and telephone) are run underground (1.1 miles) to main house. The property is serviced by Farmers Electric Coop. The ranch is agriculturally exempt and the taxes totaled $12,159.24 in 2014. Tranquility, privacy and unparalleled riverfront recreation await your family and friends at Walnut Hill on the Sabine. 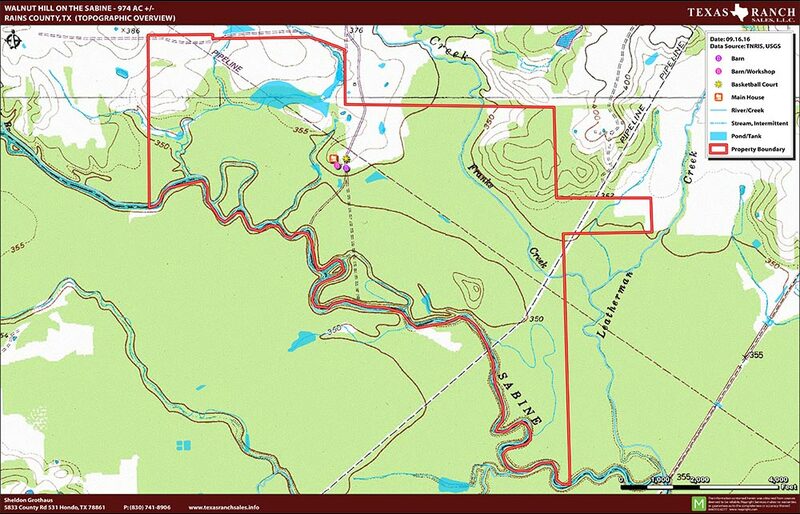 Located in the game-rich “Sabine Sanctuary,” this privacy-fenced refuge contains one of East Texas’s rarest treasures.